The whole point in setting your goals is so you can accomplish those things you really want in life. Goal setting is so unbelievably powerful. Goals must be specific, written down, and have a time frame. Having good organization is a hard thing to do in the Real Estate business because we are constantly interrupted. You have to be able to multi-task. We all want to get to where our business is repeat and referral, but it will take good organization, consistency, and patience. Sadly, most people fail to achieve their goals not because they’re lazy or lack self-motivation, but because they were never “fully committed” to succeed! Walt Disney would frequently tell those around him, “When you believe in something, believe in it all the way, implicitly and unquestionably! According to Zig Ziglar, there is danger in setting your goals because you might not reach them and if you don’t reach them, there is that little damage to your ego, to your self-image. But, there is infinitely more danger in not setting your goals. Here’s a great little goal setting application to help you set your goals during the fourth quarter of this year, and help you prepare for the upcoming 2010 year. 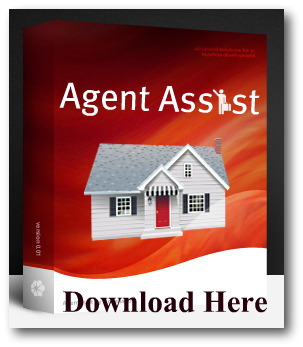 Agent Assist is the perfect application designed to map out what it will take to achieve your goals in Real Estate. It’s very easy to use, easy to download, but you will need Microsoft Excel to run it. Now more than ever, we need to redefine our goals, our challenges and our obstacles. It’s easy to know where we are, but can we determine where we are going, simply by setting our goals? Yes!